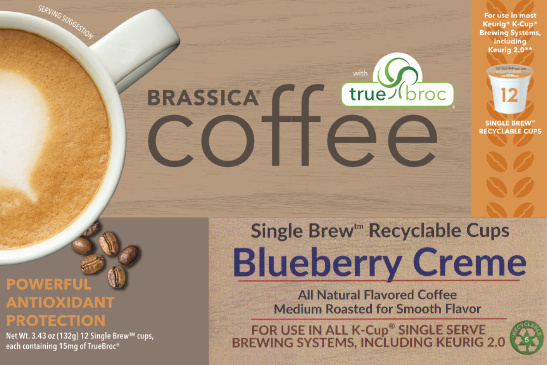 A Rich Blend of French Roasted Central & South American, & African Arabica Coffees with blueberry creme flavoring. A strong aroma with a bold finish. Each recyclable cup contains 15mg of TrueBroc® glucoraphanin, a long-lasting antioxidant from broccoli that helps to support your detoxification system. Each box contains 12 Recyclable Single Serve Cups. DISCLAIMER: Information on this website is not a substitute for the advice of a qualified health professional and is not intended to diagnose, treat, cure or prevent any disease. This website is intended for educational purpose only and is in no way intended to substitute for professional medical advice, contradict medical advice given, or for medical care of any kind.